Human resource department plays an important role in designing and implementing performance appraisals. Infact, the HR team acts as mediator between the functional heads or reviewing authorities and the employee. It is the human resource teams responsibility to ensure a smooth implementation of the appraisal process. The first and the foremost responsibility of HR team is to design the entire appraisal process. Make sure the process is simple and does not take too much time. The HR team needs to know the responsibilities assigned to each and every employee for them to create and design a system where their overall achievements can be rated with respect to their key responsibility areas. An individual representing the MIS team cannot rate himself/herself on the KRAs of a marketing professional. As a HR professional, you need to sit with the functional heads of all departments so that you exactly know what all tasks have been assigned to which all team members. 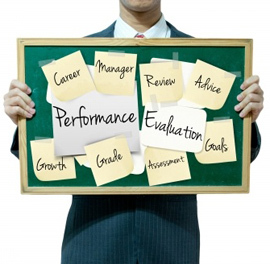 The employees need to be fully aware of the performance appraisal process. The criterion of performance appraisal needs to be very clear and transparent. Provide proper training to employees so that they take the entire process of performance appraisal gracefully and sportingly. You need to make them understand that appraisals are done not to downgrade or insult anyone but help individuals set realistic goals and expectations for themselves and work towards it. There are employees who do not appreciate the idea of performance appraisal and feel it is just a waste of time and energy filling elaborate forms. It is the HRs responsibility to change this perception. Performance appraisal is just not a method to increase ones salary but provide feedbacks to employees and guide them accordingly. Call employees on a common platform and make them understand the importance of appraisal process and how would it help them in their respective careers. The HR team also needs to sit with the reviewing authorities to ensure appraisals are done on time and only the deserving employees get the benefits. Appraisals should not be for everyone but only for those who have worked really hard all through the year. You need to help and sometimes also guide the managers and supervisors so that a fair appraisal is done and no deserving employee is at loss. You can also give your valuable feedback to the functional heads based on your day to day interaction with the employee concerned. Apart from his /her routine work, how one behaves at the workplace, what is his relation with superiors/ fellow workers, punctuality, and discipline also play an important role in performance appraisal. Once the appraisal is done, it is your responsibility to hand over the increment letters or review reports. Make sure the letter is handed only to the employee concerned and not to anyone else. Appraisals and increments ought not to be discussed in public. Your role does not end here. As a HR professional, you need to ensure employees are satisfied with the appraisal process. You need to explain an individual as to why he/she has got or not got a salary hike .Immediately arrange a meeting with his superior if you are not able to handle the situation or find a solution. Many people start looking for a change or quit immediately after the appraisal process. This happens because either the doubts are not addressed properly or individuals who have got a decent hike look for better opportunities outside. Take feedbacks from employees as to what they feel about their appraisal and whether they are satisfied or not?